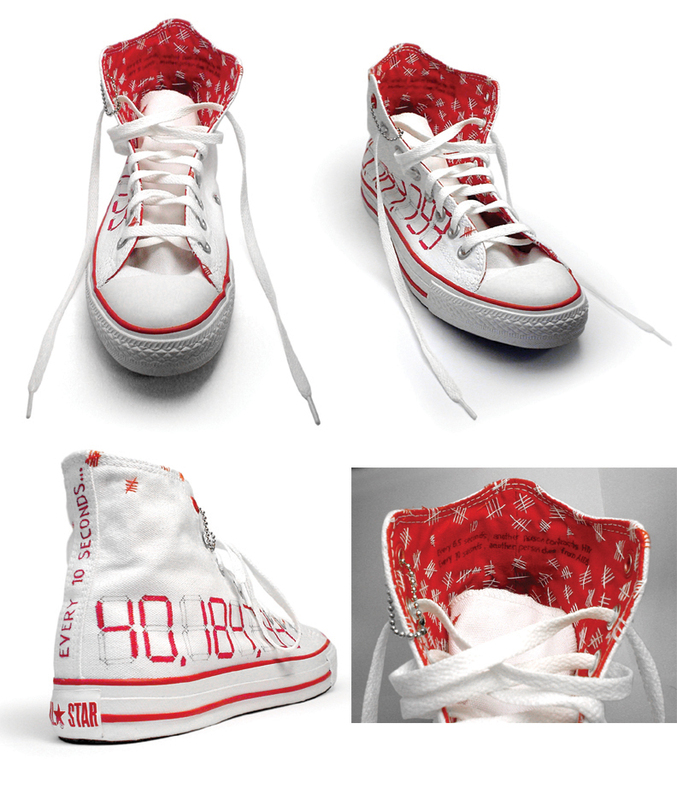 Back in March 2007, soon after starting Designverb, I was selected as 1 in 100 artist worldwide to create a design for the Converse JoinRed initiative to bring AIDS awareness and to raise money for the cause. Above is the one of the final designs I submitted which was stitched by hand and went through quite a design process even though I later submitted a re-worked design because of trademarks issues in my first design. Though I am not a shoe designer, I approached this project as any of my other projects diving into research, discovery, meaning, definition, creation, and refinement. If your interested, read after the jump to see the design process, thinking, and some other design concepts I thought up but did not continue with in this short 2 week project. 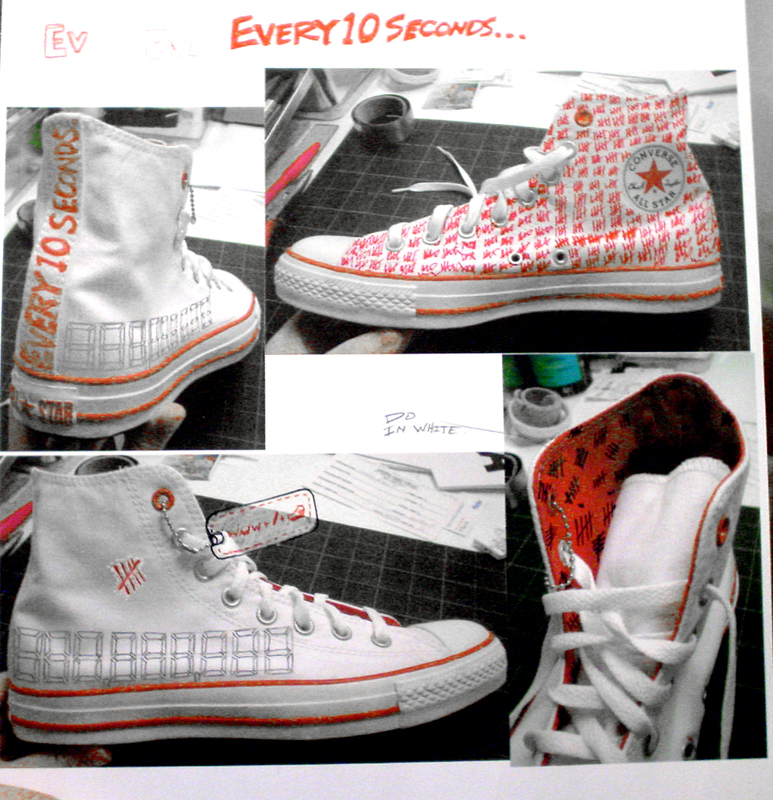 I was contacted by Converse to submit some samples of my work along with a brief bio back in March of 2007. A month or so later I received the above letter and box with a pair of JoinRed shoes welcoming me to this invitational initiative. I was 1 of 100 artist worldwide chosen to participate. A few submissions would make it into production, and the rest would go into a global gallery tour to raise awareness. I had about 2 weeks to design and create the design. I had a few thoughts and doodles, but I’ll share with ya’ll some more concrete sketches which directed my final design. Above are some initial thoughts, including the “Concrete shoe” concept stating that the AIDS issue is like the Berlin wall… something that is heavy and permanent indicating a long term situation, not easy to ignore, and needs to be torn down and will take an entire community to make it happen. Indeed this was more the sculptural artistic piece, rather than consumable product, but it had a deep meaning. 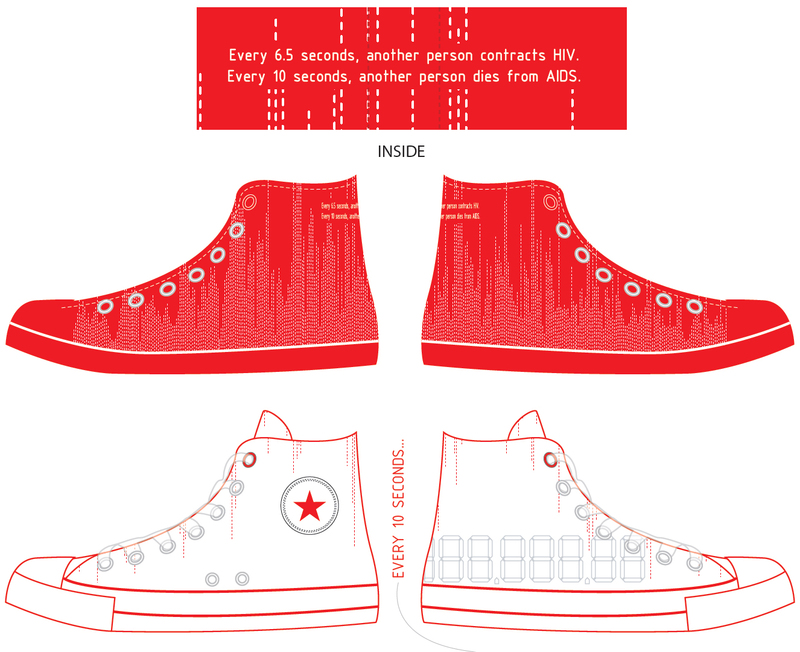 I thought of a dynamic shoes with a changing counter indicating the current number of deaths due to aids… this caused a real time understanding which tends to make people think a bit more rather than seeing static number. 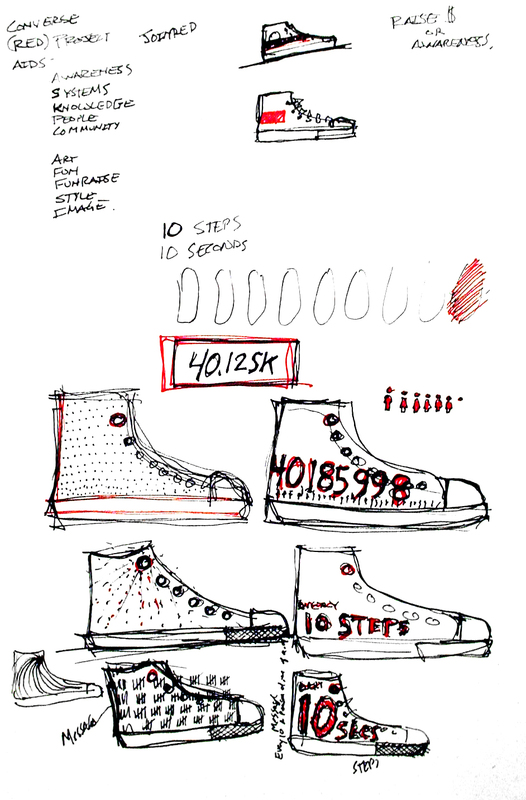 Later sketches looked more into meaning and style a bit but incorporating some more information I’d learned about what happens every 6.5 seconds (someone contracts aids) or every 10 seconds (someone dies of aids), which I somewhat phrased into every 10 steps since this is a shoe. I decided that information to create reaction to observers was critical…. hence I used large number,s or smaller slash marks in connection to this number. Some early photo montages… basically I printed out some photos and used colored pencils to see what some ideas might look like. 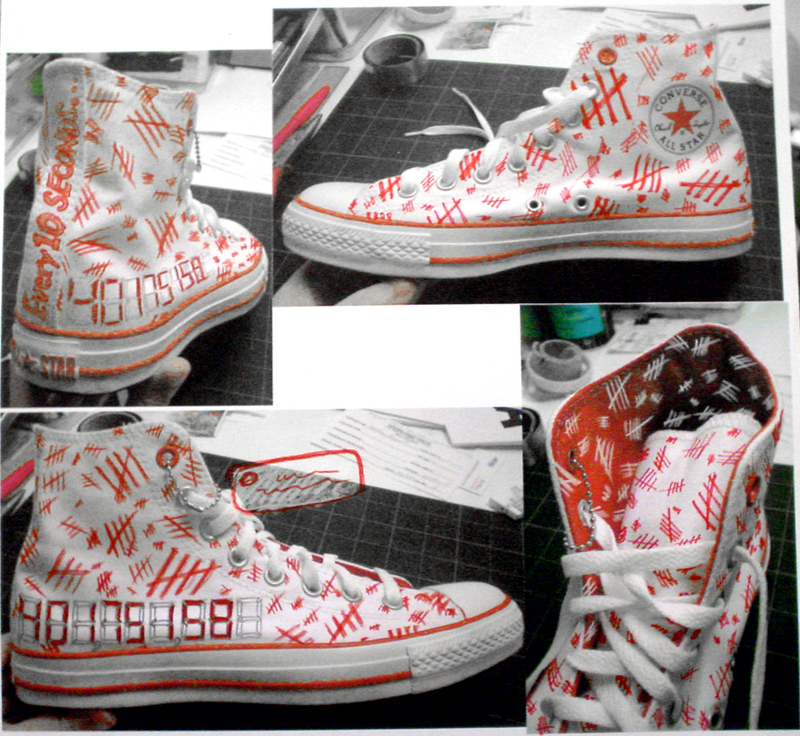 I really got into these slash markings having it represent people along with the counter on the side of the shoe which a user filled in independently based on a dynamic counter shown during purchase. To simplify it a bit, took the slash marks to the inside, which also helped define two other thoughts. AIDS affects people that are connected to the disease hence touches ones skin. The disease has gotten so bad that it has overflowed. We generally do not like things to overflow and just like aids, we must fix this and contain the overflow. Continuing along with thoughts on overflowing, I wanted to make it a bit stylish with a few slash marks flowing over the rim. 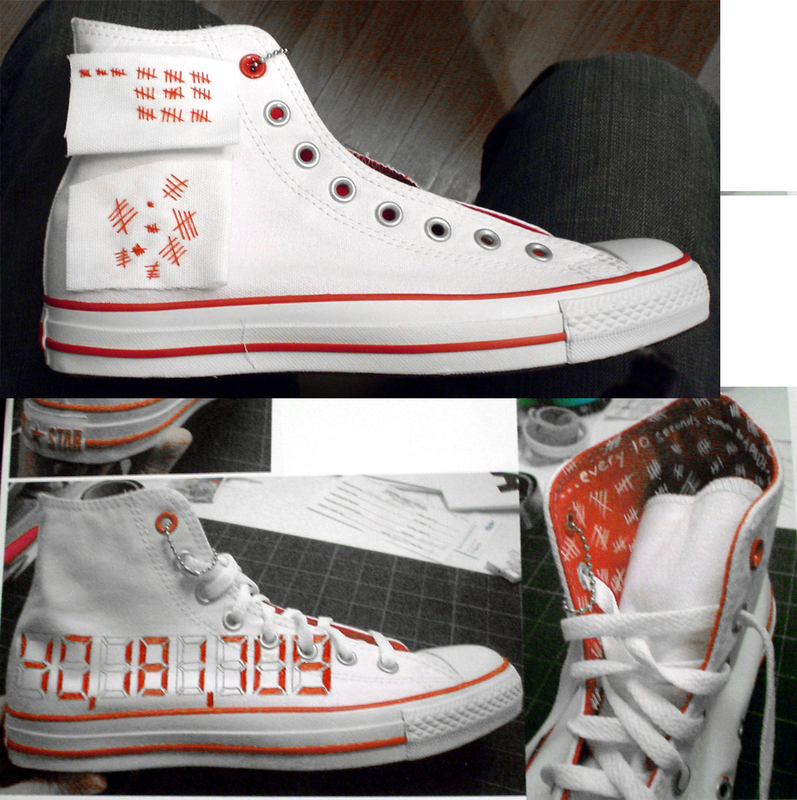 Converse loved the shoe, but I later found out the slash marks were a trademark signature of a competitors shoes and they asked me to redo that portion of the design. I had a bunch of ideas, but the one I went with is the design below which changed the slash marks to a height graph representing time horizontally and totals vertically. These would be stitch marks as well as opposed to print. By creating this awareness and mystery creates a curiosity to question from viewers. Through this connection creates an interaction that allows “people wearing the shoes” to share their knowledge on AIDS awareness or to share their experience in buying these shoes while learning a few key facts on AIDS and the story behind the captivating, real, and compelling number. These numbers also facilitate a story between separate buyers since numbers on each individual shoe signifies a different period of time to discuss in comparison. 1. Every 6.5 seconds, another person contracts HIV. 2. Every 10 seconds, another person dies from AIDS. – because much like AIDS itself, knowledge can’t be acquired simply through looks. One must ask, question, and learn by looking deeper than what’s visible. – To reflect our societies knowledge and awareness in this subject matter. Only those affected really ever research and know. – because AIDS is something we want contained and kept inside, but we must as a society spread knowledge of AIDS in order to contain it. One of the largest issues with AIDS is lack of knowledge and awareness. Through interactions such as these, knowledge about AIDS will hopefully be enhanced and improved if not stopped. 2. The shoes are manufactured with different numbers dependant on the data from the world AIDS clock, hence every shoe is independent and have different numbers based on the time of manufacturing. – Stitch everything, numbers, slashes, text,. – Add more stitch slash sets to the outside to represent a worse case overflow. – Continue white stitch slash sets through to outside layer. – Would be nice to have in black with red stitches. Your design combines both high-tech and a very low-fi/low tech technique—digital graphics and counter vs the hand-sewn, so how did you come up with your design? Tell me about your process. Prior to receiving this project I’d just returned from an inspirational Bill Clinton lecture in regards to his HIV/AIDS awareness initiative at the TED2007 conference. In Clintons lecture he spoke about the awareness of the problem and the disorganized treatment needed since many providers abused the system for profit over cause. Clintons lecture gave me the understanding that “awareness” and “knowledge” were vital in fighting AIDS if not more important than funding itself. I’d been knowledgeable about AIDS over the years, but his story compelled me to really understand the bigger picture. There’s only so much advertising and marketing can do, but to really understand and be affected, a story, much like Clinton’s had to be heard. I had a glance at several JoinRed shoes from the first series (via blogsphere). Most of them were patterns, JoinRed colors, logos, sayings, and a few were African inspired patterns which I liked. The issue I had with these designs was that I didn’t get anything else from them. They looked great, but that was it. Perhaps some people asked “What’s JoinRed” or “Where’s that pattern from” but most likely not. Did these shoes bring AIDS awareness to observers, or did they just look cool? Did people know about JoinRed previously or did they just ignore the unknown Red Brand? Creating a cool shoe was kind of out off the picture for my design, but promoting JoinRed was the next best thing to do somehow. The problem in creating a promotional shoe is that people in general do not want to buy objects that promote issues such as AIDS. AIDS is not a brand, it’s a problem. It’s not that we don’t care; it’s just a touchy subject to be wearing around. Reds fine, but wearing a product that shouts AIDS is a bit much…unless it’s directly related, much like Lance Armstrong’s subtle yellow rubber wrist bands, but Converse doesn’t have AIDS. 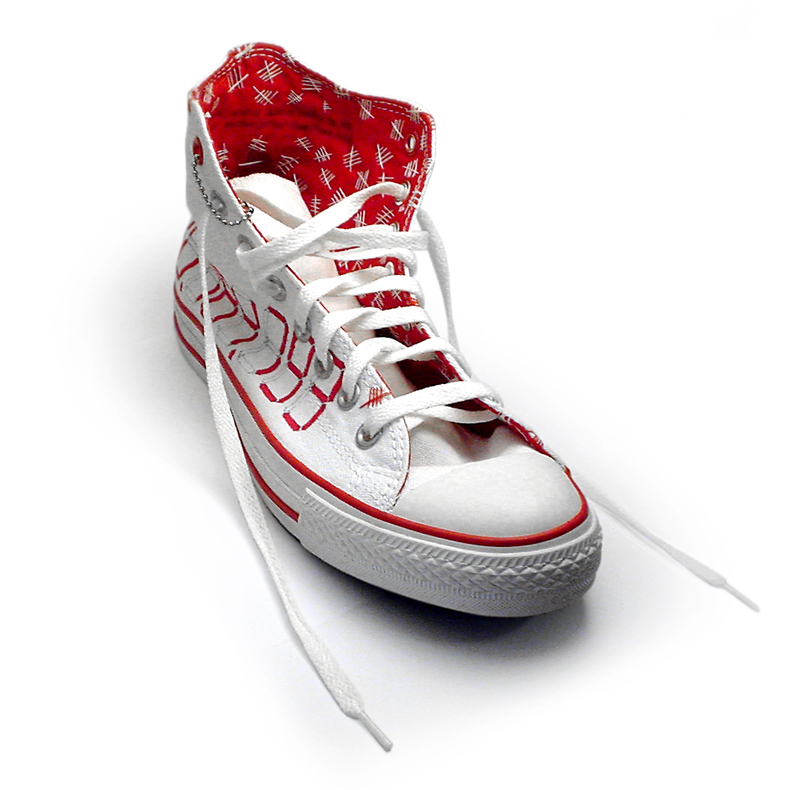 Converse is a platform to help spread the awareness; hence plastering a shoe with JoinRed logos and patterns would not satisfy my wishes. Personally those JoinRed plastered shoes look great, but I don’t think I’d ever wear them. So now I had a dilemma. I knew I wanted a shoe with more story than just style, but a stylish shoe would sell more (more profits) but bring less awareness and the “story” direction would do the opposite. Converse was donating 10% of sales to AIDS foundations… did I want to create something that would bring more to money to the foundation, or more “awareness”? Could I get the best of all worlds? Create a shoe made of grey coarse concrete. Add a crack to it and embed a stamped number referring to the AIDS clock. This shoe was not wearable, it was a sculptural piece of art that was heavy, static, and with presence, much like a memorial. The AIDS problem is much like the Berlin wall, it’s a huge problem we can’t just ignore and throw away…we have to react, do something about it, until it’s broken down. Design a shoe that looked great, was stylish, caught attention, and was representative of African culture much like the previous JoinRed shoe series. This would be wearable, and would probably catch the eye of most people, but did not have much of a story. It would sell more, and make more for the foundation. I wasn’t sure about just representing African culture though because even though Africa has the largest problem with AIDS, it’s not the only place. Create an informative shoe that caused curiosity for discussion, reaction, engagement, spread awareness, and educate. A shoe with a story and through the person wearing it. 4. Frustration shoe (Scratched out): This was an idea out of frustration. I wanted to write on the shoe harsh words saying something like , “Don’t promote, just give”. 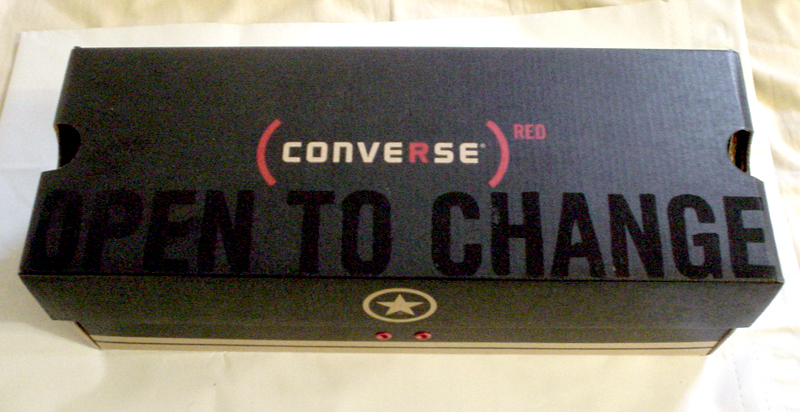 Converse is donating 10% of sales to AIDS foundations, but I was wondering where the other 90% went. 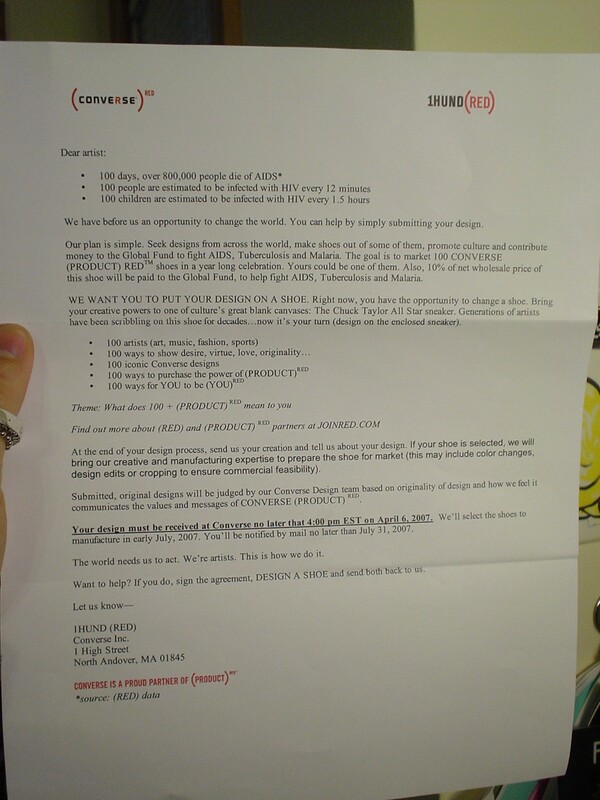 Going back to Clintons lecture, I asked, is Converse doing this just for promotional value, and not for the cause. Why not donate 100% of the net sales, or least 100% of the profits. Why not just donate and stop promoting… I’m guessing the amount of money sunk into this project is way more than the 10% of sales they would raise, but perhaps I’m wrong. Anyhow, I was way too stressed out to think about this concept since it kept looping in my mind as a good or bad thing. So, damn…what do I do now? I have only a day to figure it out now! I loved the art piece, but I don’t think it’s what Converse wants. I love the story piece, but I don’t think it’ll sell as much. The stylish concept seems to fit best with what’s been done but I wanted more. A few hours later, I decided to create a hybrid between all the designs; taking elements from each and melding their strengths into one design. A few more hours of sketching I knew what I wanted. I kicked off the fabrication of the design in the evening after work and16+ long hours throughout the wee hours of the night later it was done!!! Whoohoooo!! I was incredibly happy with the results though I couldn’t finish the nice instructional “tag”, instructing how to retrieve your number. I wanted a shoe that shared a story by creating an experience with others through discussion to acquire awareness in AIDS. This shoe captures ones attention by the visibly large numeric number on the shoes side along with a quote on the back heel stating “Every 10 seconds…” causing mystery relating to the number. From this interaction caused curiosity from observers leading to engagement, discussion, knowledge, and understanding from the “people wearing the shoes” about their experiences in awareness for AIDS and the story to the number. These numbers also facilitate a story between separate buyers since numbers on each individual shoe signifies different periods in time to discuss in comparison. I was a bit shocked when I took a glance at my shoes number a few weeks ago. 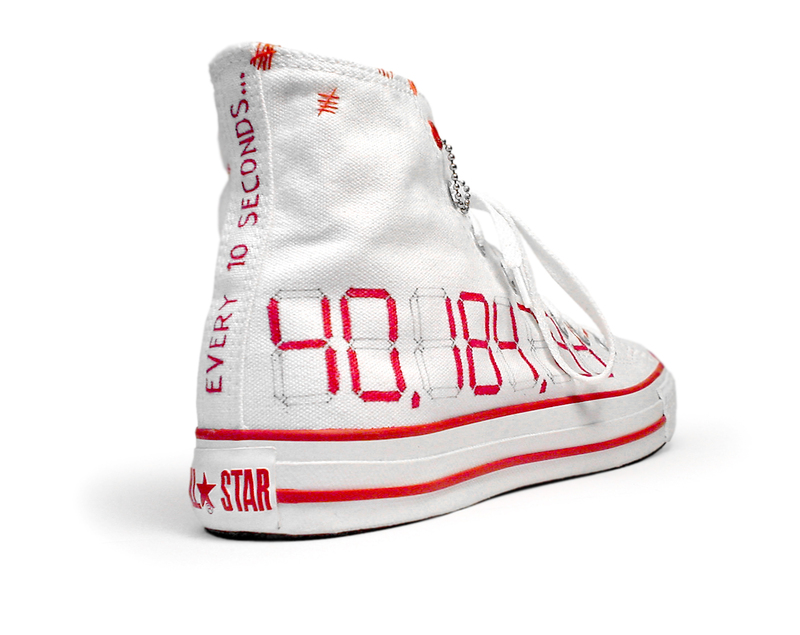 When I sent my shoe to Converse, the amount of people affected was 40,184,793. A few weeks later that number was around 40,400,000; over 200,000 more people had been affected with HIV/AIDS a few weeks after my submission. I went back today, and the clock was 40,067,000, which meant less people were affected, but it also meant more people had died since. Some slash sets overflow to the outside of the shoe at various points and seem like stitch marks, reflecting the need to patch up something that is expanding and in need of healing. – To show that we want death rates to be contained and not spread. – The number represents the customer’s experience, the number of people affected with AIDS that moment, and hopefully when they learned more about the AIDS awareness. 2. The shoes are manufactured with different numbers dependant on the data from the world AIDS clock, hence every shoe is independent and have different numbers based on the time of manufacturing. This would cost more during manufacturing, but would give each shoe a very independent point in time. And, was it hard to do all that sewing? Is sewing new to you—and your art and design? I did feel much better sewing it in since it’s more hands-on and less manufactured. The shoe has more value to me now because of the time spent. The interplay between hi-tech and low-tech worked out nicely…there might be something to say how both worlds can help out in the cause or even who’s vulnerable to AIDS. The digital counter is an element that represents a specific point in time, a date, a dynamic figure, and a status. These numbers change, are compared, and discussed. People ask about these numbers; limited editions, world records, countdowns, progressions in time, amounts, etc. I wanted a shoe that did more than just make people look at it. I wanted them to see it, wonder, get curious, and ask the person wearing it about it. Numbers do this…we ask what does that number represent all the time. In this case, it’s not a happy thing, but it creates a connection between two people in a visual conversation, in hopes for a longer verbal discussion, experience, and awareness. The shoes intended to have an empty digital counter stitched on the side urging a consumer to fill it in by logging onto a webpage which shows the dynamic number they should use. This number represents a specific time the consumer bought the shoes, and hopefully found out more about AIDS awareness through this webpage. 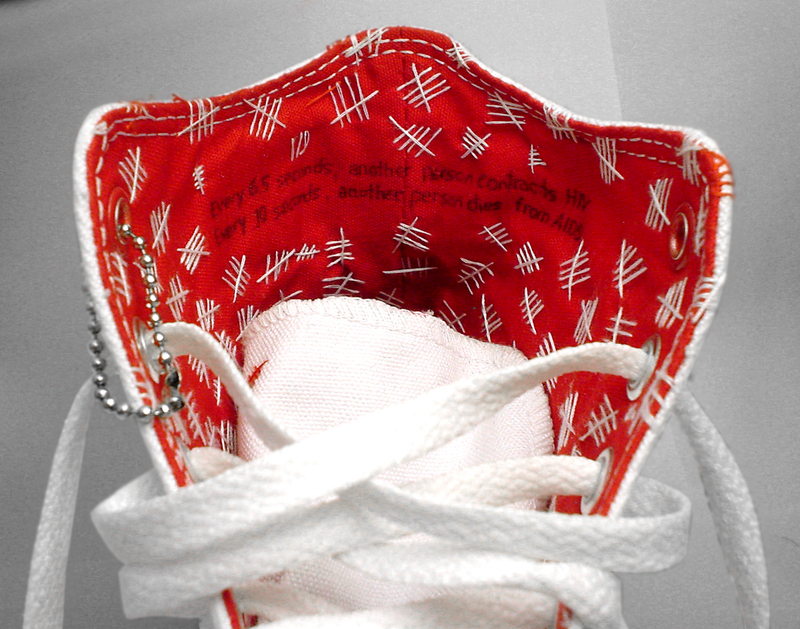 The number is large and bold on the outside of the shoe to gain attention. AIDS is not a subject people want to bring up, but attracting watchers to wonder is vital in creating curiosity, which leads to interaction, and hopefully education and awareness. 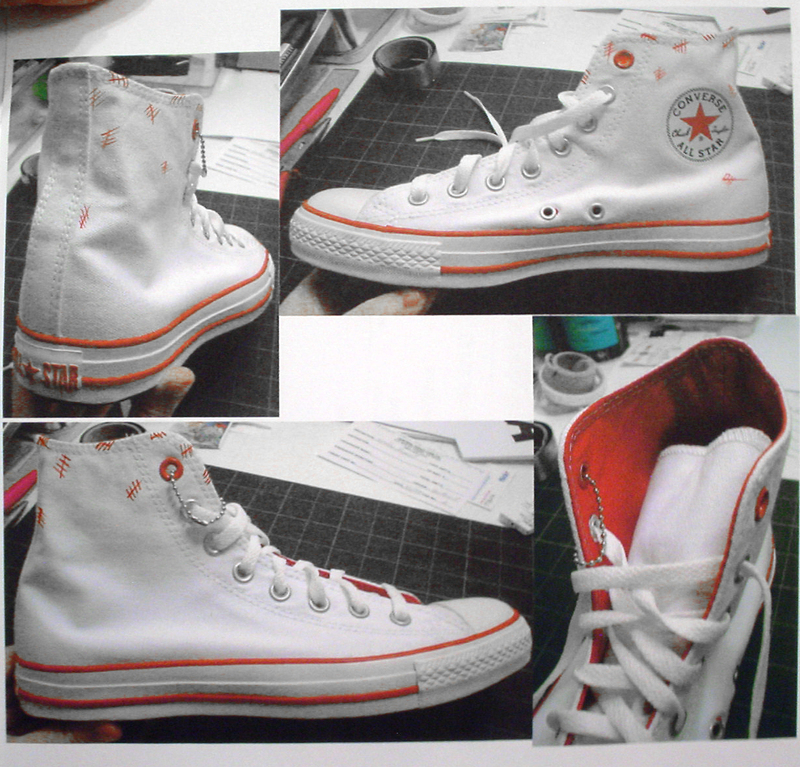 How does your Converse design relate to the rest of your design work. I mean, looking at your website, you have an amazing sounding career with great clients – so how does it relate to what you do for them? My designs tend to have flare in tech, fun, environments, interactions, and people. Most of my projects are very deep in research and have more function than aesthetics, though aesthetics is a function these days. I’d say the one huge relationship in most of my projects is “story”. Everything has a reason and purpose. Most everything is calculated, yet some elements are spontaneous for the better. Without story, I do not find designs as appealing. Not all have, but the ones that do, are desirable. It’s like anything really…think of an object you have owned for many years, but wanted to trash so much, but never did because it had a story; It belonged to your great grandmother who flew across the world, you grew up with that teddy bear, it was a treasure from the pirates in the China, it was the shirt you wore when you met your wife, it’s the rock that cracked your head open…. it had a story. Also how would you describe what you do for them? Every client has a different goal; to make profits, solve problems, finding problems, reinventing, making projects look better, work better, etc. I play, discover, uncover, realize, dissect, disrupt, object, create, change, evoke, and solve many things….lots of verbs I know…hence my blogs title: “Designverb.com”. But to tie everything together again, you must have a compelling story, a reason, and a belief for your ideas. Design to me is an adaptive methodology in discovering, playing, creating, telling, and solving tangible and non-tangible emotional experiences. In this shoe case, I had to make my own goal which was to create a shoe that would be worn, seen, and discussed. I wanted a shoe that shared a story and created an experience with others through discussion. Tell me about your art—does it get exhibited—what are you interested in with it. How does your shoe relate to that body of work? Most of my art work is rather old…meaning most of it is from High School and bits from college. I had several exhibitions during those time, but none are really exhibited anywhere today besides my webpage, which reaches a good audience still. I’m a bit of a web geek (design geek), so the web world counts as a nice gallery space for the world to have access to, even though it’s work I did when I has a teenager. Some ask me why I leave it up on my webpage…I say because it’s always a part of me, and I think it’s important for people to know what I did for a good 10 years in my life. Art and Music are my foundations in Design, both lending my desire for storytelling and a connection to emotion through my work. Both also created my discipline in working. In my perspective, art is awesome because it seems less politically driven. You do it for yourself more than for others, even though this sometimes gets the best in you. As for the shoe…It’s art, in the sense that it’s not something that’s very commercial, but it has a depth. It’s still design, but I think of my design projects as a transformation of my art work. What do you want people to take away from your shoe design in terms of (PRODUCT) RED? But also in terms of trying to help people? Helping comes in many ways; donations, time, discussion, and knowledge locally or globally. Some people can donate tons of money, some can make their neighbors more aware, some can blog about it, some can design around it, some may change their career paths, and some may ignore it for awhile until something happens that triggers them. We have plenty of problems in this world, but sometimes people are not informed about everything and nothing is done…hopefully more people know now and react. 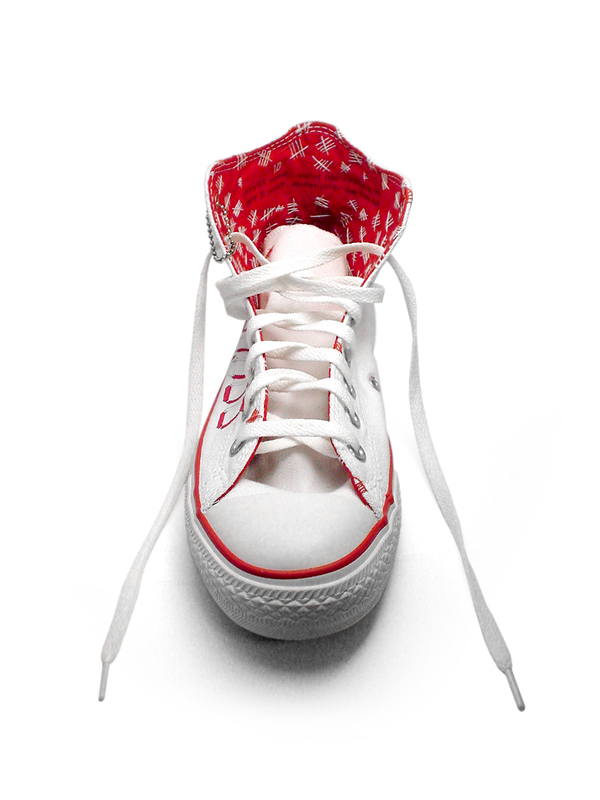 Why is participating in Converse RED a good way to drive change? Converse/Nike is a large and inspirational platform to reach a broad audience… I don’t want to say their like McDonalds, Starbucks, or Oprah, but they are! They have the power to influence millions through many mediums and channels. Who influences you and your creativity? Everything inspire me! Food, TV, tiny kids, the web, tech, frisbee, problems, emotions, our goofy selves…. but major influences would definitely be from my upbringing in music, art, and culture. Can creativity and art make people care? Overall yes, but you can’t get everyone to care. There are ignorant people in our little mean world, but everyone has buttons to push for change. I’m an optimist, so I’ll say yes; creativity and art can make people do almost anything if you keep trying. What do you think the role of an artist is in a cause? Whatever they want really! Art is really just an opinion. The goal is to disrupt, inspire, discuss, reject, abrupt, ponder, accept, to just sit, etc. The role of an artist or for anyone’s matter is to communicate with an audience and share something, a story, an experience, a thought, a discovery, a solution, an idea, or just what they are doing. In the case of a cause, an artist is trying to get others to participate, get involved, or help out however they can. Do you see your art as working to effect change, if so how? What about in other areas of your life? Every action has a reaction. Every action also carries a different purpose. My art/design effects change in a variety of ways, but it really depends on the project…but usually, it’s as simple as making things better, or solving a problem….though I’m in my sustainability mode these days; Climate Crisis, World Changing, Carbon Neutral, etc. This entry was posted on Sunday, August 1st, 2010 at 8:37 pm	and is filed under art, brand, design, inspiration, materials, me, style, thoughts. You can follow any responses to this entry through the RSS 2.0 feed. You can leave a response, or trackback from your own site. I just wanted to drop by to say I really love your design & I really liked how you did a lot of research to create your shoe. WOW! AWESOME project Tango! You are an absolute genious! 😉 Very cool design and concept. Thanks for sharing your process and your story about this design! Very interesting! I am an optimist, so I say yes, creativity and art can get people to do almost anything if you keep trying. I’m looking around for inspiration whereas my very own art and designs could be used on different Apparel etc. 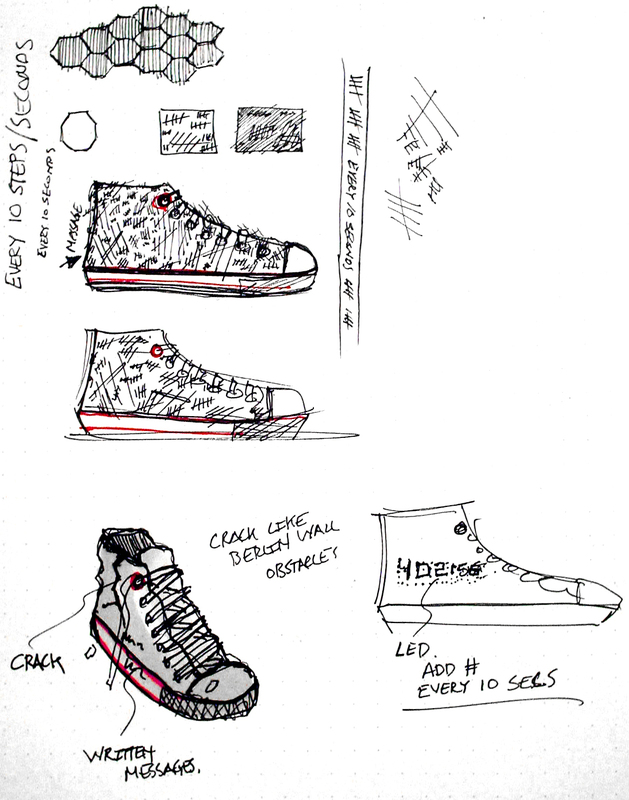 Came across this section of yours as i type searched ‘design create sell print converse’ . This creation of yours onto a popular product with a worldwide iinterest and to do with a worldwide cause puts things into better perspectives and most certainly admiration and inspiration (my daughter has interest in this too- she’s 14) !!. I recieve commision ( actually to this date i havnt sold anything!!!) on my own art at CafePress and SpreadShirt websites which sell for me on there own Tee Shirts etc. I could do with a chance like what you hav been given, we all could. Your design is eyecatching – perhaps simple but thinkn about it more makes u realise the important message u can easily get across without holding up a big banner or shouting it out. something one wears with this kind of message is certainly worth the effort. To see it is great! Nice one. my designs are found somewhere on the web my blog too on wordpress, look for – LisaSharpDesigns my original designs are signatured and dated.